Twice in the last few days, inspired by the reports from this site by Shi Jin on Birdforum, I visited the Wenyu River in the Chaoyang District of Beijing. It is a fantastic area of paddies, weedy fields and even a disused golf course. Brian Jones and Spike Millington, both former Beijing residents, used to visit this site regularly and I can see why. 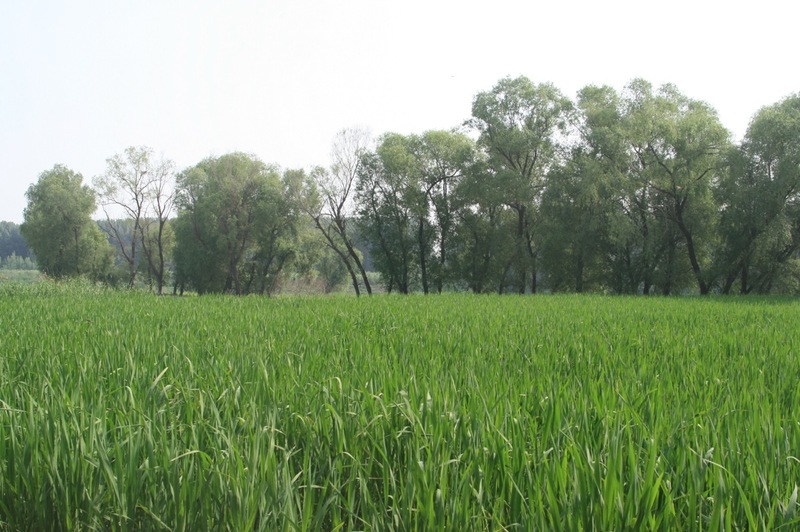 Habitat along the Wenyu River in Chaoyang District, Beijing. Perfect for Waterhens and locustellas! 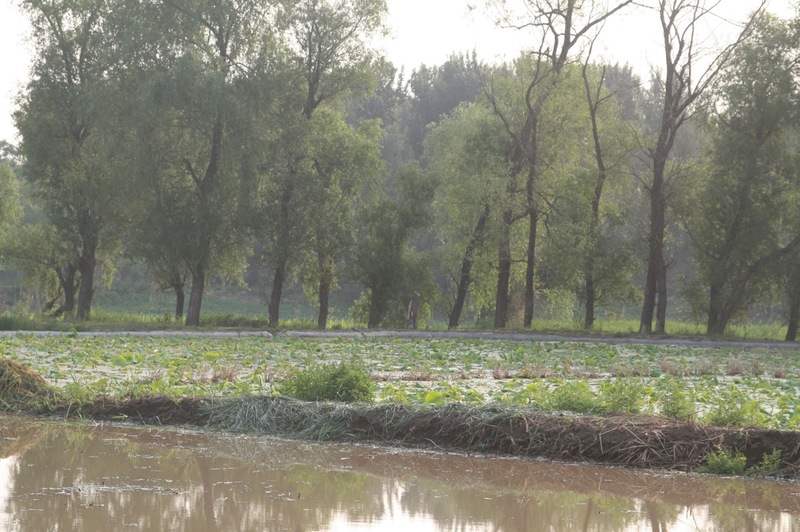 Frustrating habitat at the Wenyu River paddies. When a locustella goes down in this lot, the chances of seeing it again are slim..! On my first visit, late one evening, I arrived at the paddies just half an hour before dusk and yet I saw 4 new birds for me in Beijing – Chestnut-eared Bunting, White-breasted Waterhen, Yellow-legged Buttonquail and Little Owl.. Not bad. My second visit, early morning on Thursday, was just as rewarding. A singing David’s Bush Warbler was a nice start, soon followed by the White-breasted Waterhen, singing Lanceolated Warbler, several Pallas’s Grasshopper Warblers, two Schrenck’s Bitterns, Yellow Bittern, Pechora Pipit on the deck and a Black-naped Oriole calling from the willows. Wow. I walked the narrow pathways between the paddies and enjoyed several encounters, albeit brief, with Pallas’s Grasshopper Warblers, Black-browed Reed Warblers and the odd Zitting Cisticola. A couple of Oriental Reed Warblers were much more obliging, singing purposefully from prominent perches in the reeds. It was a cacophony of birdsong. 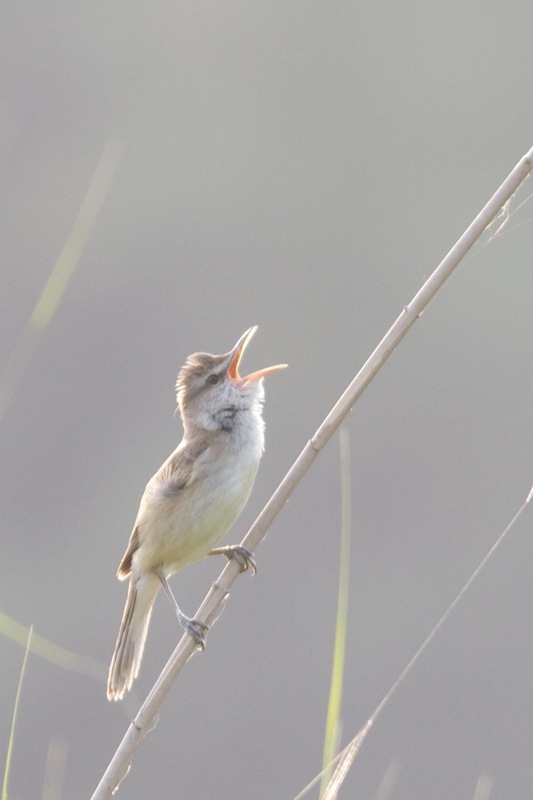 Oriental Reed Warbler singing its heart out early morning in the paddyfields at Wenyu River. 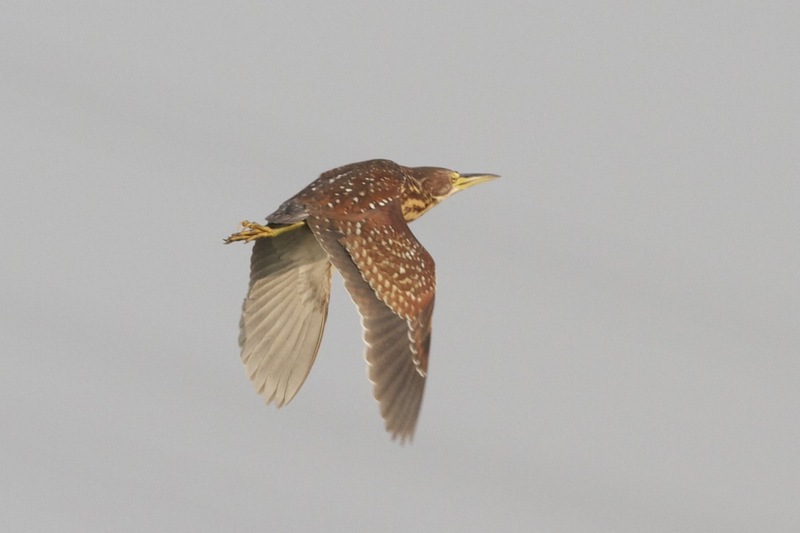 Schrenck’s Bittern (female), Wenyu River, Beijing. One of two seen in the paddies. 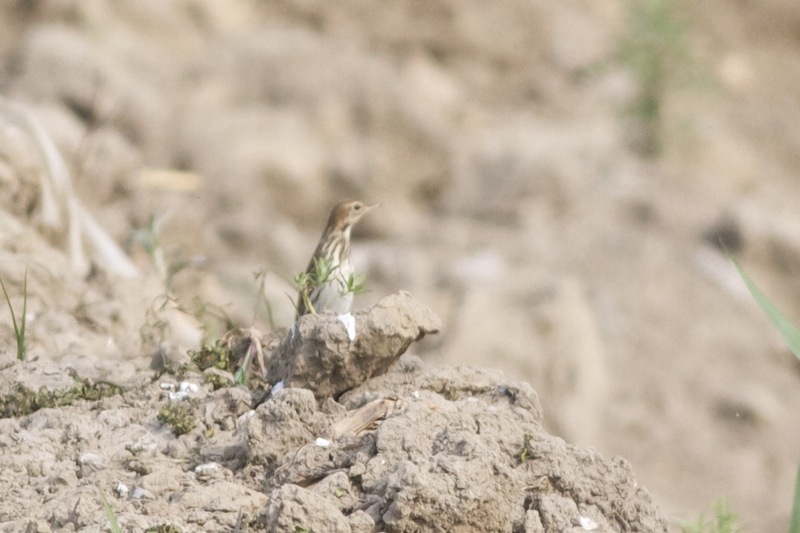 Pechora Pipit. Seeing one on the ground in Beijing is not easy! After reaching the western end of the paddies, I decided to head back and return across the maze of paths. It was along one such narrow weedy path between two paddies that I experienced one of those moments in birding that makes it such an exciting (and sometimes frustrating!) hobby. I knew that Shi Jin had seen a large locustella warbler, possibly Middendorff’s, a day or two before and so I was on the lookout for large locustellas. I had also listened to the songs of the three possible large locustellas – Gray’s, Pleske’s and Middendorff’s – on Xeno Canto Asia just in case. Suddenly, I flushed a bird from the path that zipped into the paddy and down into the vegetation before I even had a chance to lift my binoculars. It was clearly interesting – my sense was that it looked larger than the Pallas’s Grasshopper Warblers I had been seeing, but still looked like a locustella in shape and structure.. ..it was plain looking, greyish, without much, if any, contrast on the upperparts… Hmmm… could it be one of the large locustellas I had been thinking about? I knew that there was a very good chance that I would never see it again… they are notorious skulkers and it was a large paddy. However, I decided to wait to see whether anything emerged from the area in which it had gone down. To my surprise, just a few seconds later, a bird began to sing and the sound appeared to be coming from the same area… I remembered the songs from Xeno Canto and immediately ruled out Gray’s and Middendorff’s. It reminded me of the Pleske’s song… I put two and two together – large locustella, song like a Pleske’s – and in my mind a big neon sign lit up flashing “Pleske’s Warbler!!”. But could it really be a Pleske’s Warbler? In Beijing?? The bird sang for a few minutes and I quickly took out my handheld video camera to record the song, knowing that I would need that to have any chance of identifying this bird for certain in the absence of a good sight view. I recorded a few seconds of the song and then concentrated on trying to see it. Only once in the next 20-30 mins did I see a bird in that area, an incredibly brief view as a largish bird flitted across a small gap in the vegetation. Again, I got nothing on it other than it was largish and plain looking.. Frustrating to say the least. At this point, I was excited.. I really thought that there was a singing Pleske’s Warbler just a few metres away from me. I sent a SMS to Shi Jin to tell him. A few minutes later, after no sign of the bird, I began to walk back to the metro station as I didn’t want to be too late back in town. And I wanted to download that sound file and check it against Xeno Canto! I then received a reply from Shi Jin to say he was on his way. He only lives 10 minutes away by car, so I headed back to the site to meet him and show him the precise spot. There was no song now and no sign of the bird. We waited a few minutes and after providing sustenance for the local mosquito population and with the day heating up fast, we decided that probably the best chance of seeing/hearing the bird would be to come back in the evening or the next morning. Neither of us could make it that evening but Shi Jin was hoping to try for it the next day. After a brief stop at the Little Owl nest site I discovered a few days before, Shi Jin kindly dropped me at the metro station for the return journey home. Hmm… on listening to them both, now I wasn’t so sure.. there were elements of the song that were similar but there were also differences… Doubt began to creep into my mind. Was the singing bird a Pleske’s? And, in any case, could I say that the singing bird was definitely the large locustella I saw? I began to think that maybe the song was a different species. I listened to Pallas’s Grasshopper Warbler (the other locustella species seen that morning in the same area) on Xeno Canto but the few recordings of this species on the site sounded different). So, the bottom line is I don’t know. I have a recording that I can’t identify and a brief sighting of a largish locustella that isn’t necessarily the same bird that I recorded singing anyway…! Arrggghhhh…. If anyone can help with the recording, please let me know. I have sent it to Paul Holt (who is currently away) and to Peter Kennerley, so hopefully the mystery will be resolved soon. In my head, I am expecting my song to be identified as a variation of Pallas’s Grashopper Warbler but my heart is hoping that it’s a Pleske’s. Watch this space! Whatever the outcome of this experience, one of the highlights of the day was meeting Shi Jin, a top birder with a lot of China experience! Posted on June 1, 2012 June 1, 2012 Categories UncategorizedTags Beijing, Chaoyang, Oriental Reed Warbler, Pallas's Grasshopper Warbler, Pechora Pipit, Pleske's Warbler, Schrenck's Bittern, Shi Jin, Wenyu River7 Comments on Aaaarrrggghhhhhh!